Hey everyone! Welcome back to (social) Contract from Below. First of all, thanks to all the people who took the time to e-mail me, or leave comments on my last article. It’s amazing to me to think that people actually are reading my work. That being said I always love getting feedback so feel free to contact me (all my contact info is at the end of my articles. So onto today’s topic. 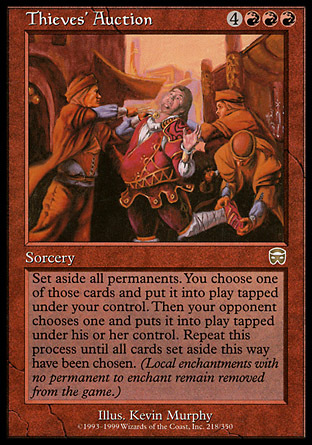 There is a lot of fine print in the in the social contract that we are all (supposed to) be following in EDH. The main points of “EDH douche-baggery” are all pretty well laid out. If you blow up all my lands every turn, combo off with counter backup on turn three, or take 15 minute turns while the rest of us watch you play you have absolutely broken the social contract and may not be invited to play again. On the other hand, there are a lot of other ways to break the social contract and make the game miserable without committing any of these bigger trespasses. 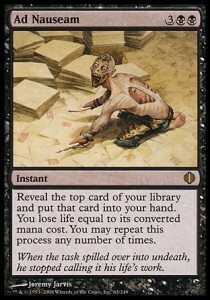 So today I am going to look at five cards that can break the social contract in different ways than the main ones. Now should these cards be banned in Commander? No. 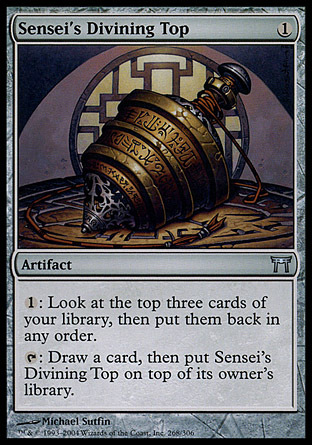 (OK so there is one of these that you could make a very strong case for banning) The banned list is designed to take out cards that ruin the games, due to the rules of commander, the multiplayer nature of the format, or the stated goals of the rules committee. None of these cards do any of these things. However, they tend to cause games to become unfun or lessen the enjoyment that the players have. So Without further ado here are five cards that you should take a good long look at before you play them in EDH. Why you should not play it.- This is the card (of the five I’m going to list) that sees the least play. In a way, I fear that this article will do nothing more than bring this card into the limelight. This card is also unique in the fact that it does something no other magic card goes. It ends the game in a draw. Therein lays the problem. I have no problem with a single massive spell ending the game in your favor, in a way that is what the format is all about. However, if you cast a big spell like this you should win. This has all the makings of a fun and interesting EDH card (big mana cost, slow buildup to something powerful) but it’s final effect on the game is terrible. Having this resolve is like seeing a great movie that ends with nothing happening (and not in the good, Monty Python and the Holy Grail way). Sure the trip was good but we wanted to see something cool. Don’t ruin good Commander games with this card. I later asked that opponent why he was going to scoop. He explained to me that he was looking to see if he had a unique color of sleeves to make sure he got his cards back. His explanation (that I thought was quite reasonable) was that he had invested several hundred dollars in his deck and that he didn’t want to see something like his underground sea walk away. The bottom line is if I am playing a card that basically reads “1-3 player immediately leave the game,” then I should rethink that cards position in my deck. Why you shouldn’t play it- We go from a card I actually enjoy (my personal brand of fun) to a card I cannot stand. You are probably looking at this card now and going through all the ways it is not so bad (it’s a creature, it takes time to power up, ect) and all that would be fine except for a few key things. 1) This card is never played on turn two and slowly powered up over a couple of turns; I do not think I have ever seen it not just cast and leveled up all the way, and 2) This card is blue, and therefore you can expect that this card will be protected. That means that everyone has one chance to hit it with instant speed removal and one player has a chance to sweep the board before the (probably mono-blue player) untaps and has his protection at the ready. I know that people will say that I should have named Time stretch in this spot. However, I’ve seen the chronologist get the game rolling to the point where we knew that we were never going to stop it. My decks can come back from one player having 2 extra turns, but I cannot fight the mountain of card advantage this card often creates. Why you shouldn’t play it– Sean McKeown (of Star City Games’ “Dear Azami”) has done a better job of telling the evil of this card than I can ever do entitled “The Worst Thing You Can Still Do to People.” The reason that this card is on my list (rather than some other combo enabler like Tooth and Nail or Hermit Druid) is that this card cannot be used outside of a combo deck. If you have this in your deck, you’ve built around it, and if you’ve built around it, you are doing something degenerative with it (that probably involves massive Exsanguinate or Tendrils of Agony with a storm count higher enough to kill more than one player). Why you should not play it- This card is probably the biggest shocker on my list and I’m sure that saying you shouldn’t be playing it will cause me all kinds of hate in the comments. I know for the longest time my deck building thought process always started with choose my general, add Sol Ring and Top, then choose 97 additional cards. I currently have 7 commander decks and own enough tops for all of them. However I only run top in the three oldest of the decks. I do not do this for any thematic reason, nor do I think top is a bad card. If fact I think that top would improve the decks it is not in. 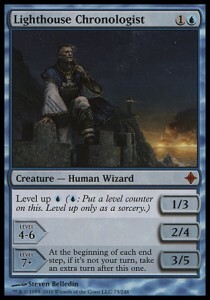 The problem I have with top is that, in a deck that I am still learning or is full of complicated cards, I cannot top fast enough to not interrupt the flow of play. Nothing drives me crazy more than someone who, starting on turn 3, takes 20 seconds right before his turn to decide which of the top three cards of his library he wants to draw. My rule of thumb is that if I cannot make up my mind in less than five seconds, then I don’t run top as a courtesy to my opponents. So there you have it. Five cards that you should give you pause before you jam them into a deck. 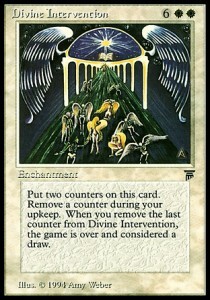 I’d love to hear other cards that are on your personal lists of no go cards. Feel free to contact me via email, leave me a comment below, or hit me up on twitter. Thanks for reading and I’ll see ya’ll in 2 weeks.